Remember pH from chemistry or biology class? The pH is a number that tells how acid or alkaline your solution is. And yes, the control of pH is extremely important, not only in hydroponics but in soil as well. Plants lose the ability to absorb several important nutrients when the pH is out of whack. If not in the proper range, the essential minerals get "locked out". Luckily, pH is a very easy thing to control. All you need is a pH test kit (like for swimming pools), or pH "dip" strips. Either testing method is inexpensive and very easy to learn. You do NOT need to buy an expensive electronic pH meter, which also requires quality control procedures. 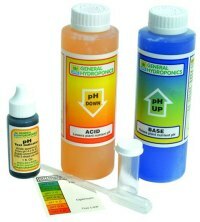 The proper range of pH for your hydroponics nutrient solution: 5.5-6.5 (6.0 is ideal). * Twice a week thereafter. If you are a worrier, test your hydroponic solution daily. It only costs a few drops of test solution. * Buy a "pH up & pH down" kit. Follow the directions on the bottle. 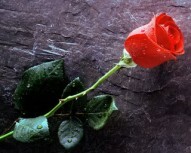 A little bit goes a long way, so be careful. You'll soon figure out how much is about right. * In a pinch (if you run out of the kit solution), you can fix the pH with these "home remedies". White vinegar will lower the ph; baking soda raises it. But these agents are not stable and buffered, and should not be used in the long run. Do yourself a favor: Get a simple kit put out by GH (General Hydroponics). It includes the test kit plus a bottle each of pH up & pH down. It costs about $15 and will get you through many gardens. Keep it simple! Aero Garden featured on City TV! The aero garden is the easiest all-in-one kit to get started with hydroponics. This is a mini-garden, more for fun and a simple look at hydro than a serious learning project. But we love ours and always keep it bubbling in our kitchen for a lively, earthy touch to the decor. The garden is started with "seed pods" or little pre-planted cups, which help to ensure success. You can order kits to grow: tomatoes, peppers, green beans, lettuce, and various collections of gourmet herbs. Even ornamentals (flowers). This ready-to-use garden and light will look perfect on any counter top so that you can have fresh vegetables or herbs year round in your kitchen. It also makes a great gift for the "hard to buy for". 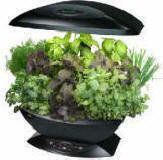 Read more about the Aero Garden or order one here: Aerogarden. 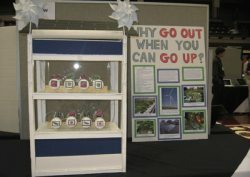 Students win Best Global Impact Award for Hydroponics vertical farm project. Recently, a team of 4 students (Scott Mills, Amelia Slick, Elise LaRussa, and Mareya Welsh) from Ballard High school in Washington submitted their project “Imagine Tomorrow” to the science fair. The team ultimately took their project all the way to Washington State University to compete, and won the award for Best Global Impact. We congratulate the team and all of their hard work on the project and hope this sparks future interest in hydroponics careers (or home hydro gardens). Can't decide which vegetables to grow in your new hydro garden? Start with vegetables you and your family love. It might be fun to grow 40 radishes, but if y'all don't like them, why waste the space? (Note: give radishes a try before you rule them out. Fresh from the garden to your salad tastes delightfully different).